Description: A typical small instrument of the Italian style: pyramidal Principal chorus (Ripieno), embellished by the solo stops Flauto and a tasteful reed stop -Tromboncini, the resonators of which are exposed in front of the Prospekt pipes. We can find such an organ in almost every church on the northern coast of the Adriatic where the influence of Venice organbuilding was felt. This particular instrument was probably made in the workshop of the most famous Venetian organ builder, Franciscan friar Petar Nakič (Pietro Nacchini) of Slavonic origin, at the time when the workshop was lead by the Nakič's pupil Francesco Dacci (1712-1784). 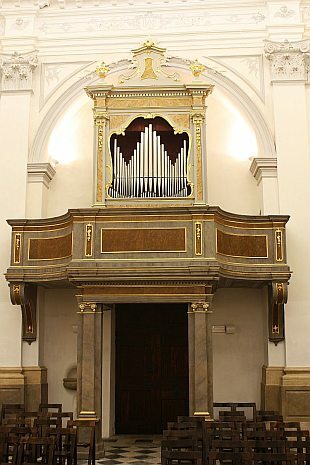 The organ was first made for the parish church of St. Mauro in Izola, but later was moved to the contemporary location - to the church of the St. Maria d'Alieto at the end of 18th century. The single manual offers 10 stops. The pedal is hard coupled to the manual and does not have its own stops. The original keyboard has short baroque bass octave. The pipes in the Prospekt are new, the original ones disappeared during the first world war. The shape of the Italian organs did not change much over the centuries. The base is always the Principale. It may be used as a solo stop or colored by higher aliquotes forming so a greater or lesser plenum (Ripieno). The timbre of the Ripieno remains soft and mild even when all the aliquotes are drawn. The Flauto (4') is used as a solo stop or it may be combined with the Principale or with the Ottava, or with both. Special combination "resembling a cornet consort" is given to be composed of Ottava+Flute+Decimanona+Vigesimaseconda. It may be also supported by the Tromboncini to give stronger reed timbre.